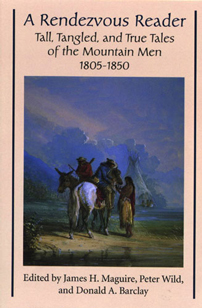 The accounts of the mountain men are spun from the experience of a nation moving westward: a trapper returns from the dead; hunters feast on buffalo intestines served on a dirty blanket; a missionary woman is astounded by the violence and vulgarity of the trappers’ rendezvous. These are just a few of the narratives, tall tales, and lies that make up A Rendezvous Reader. The writers represented in this book include dyed-in-the-wool trappers, adventuring European nobles, upward-gazing Eastern missionaries, and just plain hacks who never unsheathed a Green River knife or traveled farther west that the Ohio River. What these writers have in common is that all helped create a uniquely American icon – the mountain man. A Rendezvous Reader brings together the liveliest, most readable accounts by and about the mountain men. Whether you sample or devour this anthology of mountain horrors and delights, it is a book guaranteed to entertain.